From roaring tigers to app-enabled droid robots, our pick of the top 20 hottest Christmas toys of 2017 has something for children of all ages to love and enjoy for the festive season. Quite a lot of them are available in Dubai from retail giants Virgin Megastore, Souq.com, The Toy Store, Hamley's and other toy stores in Dubai, but some may have to be shipped from overseas. Predicted to be 2017’s version of Hatchimals, Spin Master’s Luvabella dolls are so realistic. In fact, they’re so baby like that the make sounds, feed and move as if they were real. With 3 different ethnicities available – and a male Luvabeau version too – this (expensive) toy will no doubt be on every child’s wish-list for 2017. Buy and ship it now from John Lewis to the UAE. Priced at £99.99 (approx. AED 487), plus shipping costs. What was 2016’s biggest Disney film has continued to be a solid favourite throughout 2017 for children and adults alike. With this toy, your child will have the chance to e xplore the beautiful world of Disney’s Moana. Available now at Hamley’s. Priced at £25.00 (approx. AED 122). With the 2nd film of the latest Star Wars triology due to be released this coming December, everyone is back in complete Star Wars mode – and that includes the toys that our children are playing with. For Christmas this year, bring the inner jedi out of your child with this path of the force lightsabre that’s sure to impress them. Available to order from Amazon for $49.99 (approx. AED 184), or alternatively get the Star Wars Bladebuilders Spin Action Lightsaber instead at The Toy Store in Dubai for AED 299. Every child’s favourite pup is back with a new adventure on the sea patroller vehicle! The toy uses drop-down wheels to transform from ship to land vehicle, and takes the pups on new and exciting missions. Complete with a lift, flashing lights and a lifesaver launcher – we’re sure your little Paw Patrol lover will thoroughly enjoy this new addition. It’s not yet available in the UAE, but Amazon is shipping to the UK and elsewhere – check if you have family that are able to receive the package for you and keep it safe. Alternatively, the Paw Patrol Rescue Training Centre from Souq.com in Dubai might be a great alternative – it’s priced at AED 147.99, too! In anticipation for the 8th episode in the Star Wars franchise, Star Wars: Episode VIII The Last Jedi, a new droid is rapidly becoming popular. Unlike BB-8 that has been hugely popular over recent years, the new BB-9E is a black-plated BB-series astromech droid which serves the First Order (the bad guys). Now you can control your own First Order droid through an app on your smart phone – get yours for Christmas from Virgin Megastore in Dubai for AED 649. Rolling on from the top toy of 2016 – Hatchimals – these little ‘colleggtibles’ are just as cute and are sure to be a huge hit this Christmas. Owners of these little eggs can hold them in their hands to change their heart colour, and the small egg will gently hatch to reveal a super cute, tiny Hatchimal inside. There’s over 70 to collect – with ultra-rare ones, too! You can get a 4 pack of Hatchimals CollEGGtibles from The Toy Store in Dubai for AED 70, or a 12-pack carton from Souq.com for AED 209. Your kid can now unleash their inner super star and sing along to all of their favourite songs with this karaoke machine. You can reduce the main vocal track to songs using the amazing Music Magic feature, change the sound of your voice with the built-in microphone effects and have fun with rhythmic games and tongue twisters. Plus, choose from a variety of colourful lighting styles for the built-in disco light! Buy yours and order it to Dubai from Amazon for just £39.99 (approx. AED 195), plus shipping costs. 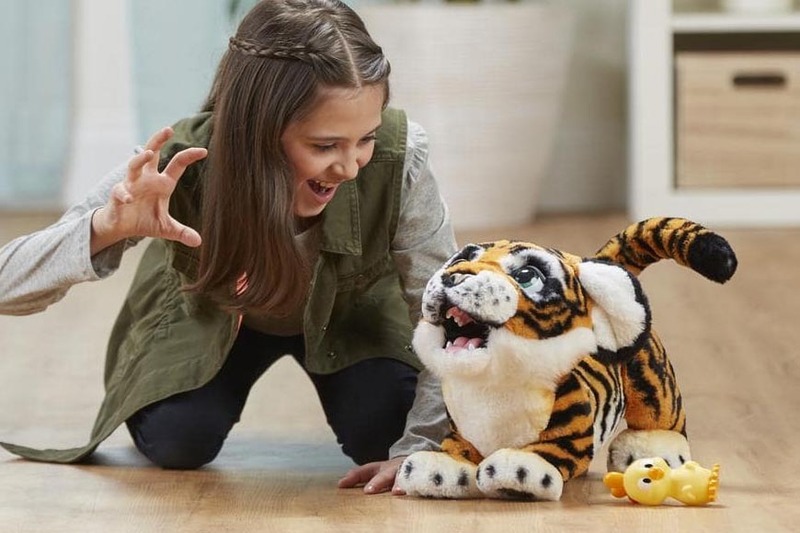 This cuddly, cute and ferocious interactive pet is ready to play… And his favourite way to play is to ROAR! If you make a noise, he roars right back – talk to him, and he’ll respond. This tiger cub responses to sound and touch, with over 100 sound and motion combinations. Your child will no doubt love petting his head, and watching his eyes close – or petting him on his muzzle and watch him move! Tyler even comes with a chicken toy that he reacts to when it squeaks. Order yours from Hamley's and ship it internationally to Dubai for £135.00 (approx. AED 656), or from Amazon. If your little one prefers a cuddly pet with a more magical personality, there’s the FurReal Torch My Blazin Dragon available at The Toy Store in Dubai for AED 625. Plus, he comes with over 65 iconic phrases and sounds your little one probably loves from the popular Disney Pixar film. Buy your Lightening McQueen now and ship it to Dubai from Amazon - he's priced at $19.95 (approx. AED 70), plus shipping costs. With all the hottest LEGO toys out this year – it was difficult picking just one to put into this list. The triumphant toy comes from The LEGO Ninjago Movie, which follows a group of friends who must defeat an evil warlord – who happens to be someone’s dad. With this – your little one will have lots of fun constructing and brick building this Green Ninja Mech Dragon. Buy the LEGO Ninjago Movie Green Ninja Mech Dragon in Dubai from The Toy Store for AED 375. Remember the popular Pie Face game that did the rounds last year? Well, now the guys at Hasbro have kicked it up a notch – and made the game over 3 feet tall! This version works like a carnival strength tester game, and if you hit the plate hard enough – you’ll ‘pie’ your friends! Order yours and ship it to Dubai from Amazon - it's priced at $21.99 (approx. AED 80), plus shipping costs. Your little one can now ride in style in their very own Disney Princess-inspired horse and carriage… Parents can pull from the reigns or push from the roof handle, and the carriage includes a floor board to protect your little ones’ feet. It comes complete with a horse clopping sound, parent and child cup holders, parent console on the roof – and your child can remove the floor board to take the reins and drive themselves. Available from Amazon, you can buy and ship the Little Tikes Princess Horse & Carriage Cozy Coupe to Dubai for $84.99 (approx. AED 313), plus shipping costs. This lovable, colourful princess is a hugely popular character from the latest Dreamworks’ film, Trolls. With Poppy in tow, your little one can always take a break for hug time – plus, she speaks 25 phrases when you press her tummy. She even plays songs from the film, and your little one will have a light up bracelet just like the doll’s, and when dancing – their matching bracelets and the doll’s hair light up to the beat of the music for a fun, fun time! Buy your Dreamworks Trolls Hug Time Poppy in Dubai from Souq.com for AED 399. This intelligent, friendly robot puppy comes with a hefty price tag – but is worth the Dirhams with his advanced sensors and smart accessories. In fact, CHiP is always alert and ready to play with your little one. He’s not like any other robot toy – he’s designed to fit perfectly as a pet for the connected family. CHiP was created to see, hear, listen and feel just like a real dog. Buy your WowWee CHiP Robot Toy Dog in Dubai from Souq.com for AED 1,699. Your old favourite teddy bear friend is BACK for 2017 – that’s right, the official return of the storytime and magical bear is happening and Teddy Ruxpin is now available to buy… Just in time for Christmas. With LCD animated yes, touch sensor story control, sing-along, TalkSync technology AND still as soft and cuddly as ever, Teddy Ruxpin will make the perfect gift for any child this Christmas. Buy your own Teddy Ruxpin in Dubai from Souq.com for AED 999. The Pokémon craze is still holding strong after being revived last year following the Pokémon GO app launch. For your children who still adore the game, they can now experience the world of Pokémon in a whole new and unique way with the Pokémon Z-Ring and Z-Crystals. Compatible with the latest video game titles in the Pokémon series for the Nintendo 3DS family systems – Pokémon Sun and Pokémon Moon, the Z-Ring can interact and synchronise with game-play for an enhanced experience. Buy a Pokémon Z-Ring Interactive Set in Dubai from Virgin Megastore for AED 249. Where magical learning fun never stops! With AppyKids Play School, your little one can learn languages, numbers, colours and shapes through music, story, gameplay and fun! Download the app to use it with the adorable Appy toy and smart flashcards that interact with the app, bridging the best of digital and physical play. Buy an AppyKids Play School toy in Dubai from Virgin Megastore for AED 29 - reduced from AED 149! Who likes to move? Beatbelle! The female version of the Dance & Move Beatbo that has been listed as one of Hamley’s top toys for 2017 – this lovely character helps to get the dance party started with your little one. They can press her tummy, or any one of the buttons on her feet to activate fun songs, learning content and dance moves. Buy your Fisher Price Dance & Move Beatbella in Dubai from The Toy Store for AED 499. Be on the lookout for villains, and defend the PJ Masks Headquarters! Your little one will have lots of fun with this top toy of 2017 – as they activate the goggles for red owl vision, and trap villains in the tree snarls… Plus, the HQ comes equipped with a fur ball shooter, ready for when trouble is found. Buy your PJ Masks Headquarters Playset in Dubai from The Toy Store for AED 499. The lovable bear is off on an adventure – with his bike this time! Standing at 35cm tall, cycling Paddington Bear rides around along to a catchy tune, wearing his traditional blue coat and red hat. Your little one will no doubt love this top toy of 2017 as they can join in his adventure as he pedals along to music, and randomly changes direction as he goes. Buy and ship your cycling Paddington Bear to Dubai from Amazon, for $42.99 (approx. AED 158), plus shipping costs.